What do you do after you've nailed multiple genres and been in highly-respected bands like Murder City Devils and Pretty Girls Make Graves? You change it up again, of course. 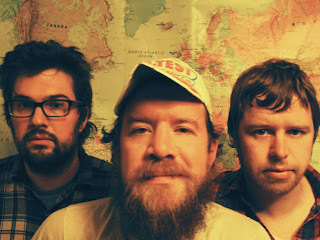 Derek Fudesco, of the previously mentioned bands, is now a member of The Cave Singers. Their third album No Witch dropped this week. It's a folksy romp of an album full of understated guitars and melodies that could bring the Hatfields and McCoys together for an afternoon luncheon. It made me want to drink a bottle of moonshine and dance around in bare feet. In other words, it's got a downhome swagger that you just can't avoid. Here's the opening track as an example. The key is the album's simplicity. The production is very clean but there's never too much going on. These guys aren't trying to overwhelm you with a ton of music, they just want to overwhelm you with GOOD music. It works. I'm particularly hooked on the slinkly track "Falls" right now. I'd put this album right up with some of the better folk/blues albums around right now. The Cave Singers can hang with The Black Keys, sure. Just let me know so I can be around to listen in.